Well, here we have another of the big reds, a Cabernet Sauvignon. This particular bottle is the 2009 vintage Cab from Root: 1, which is made by the Viña Ventisquero winery out of Chile. The grapes in this were grown high in the Colchagua Valley where the landscape is steep and rocky. It is reported that it didn't rain a single time during the growing season for this vintage, which some believe makes the grapes more full-flavored due to them compensating for the harsher conditions. And yes, that makes sense, but I don't know if it necessarily makes a better wine in the end. 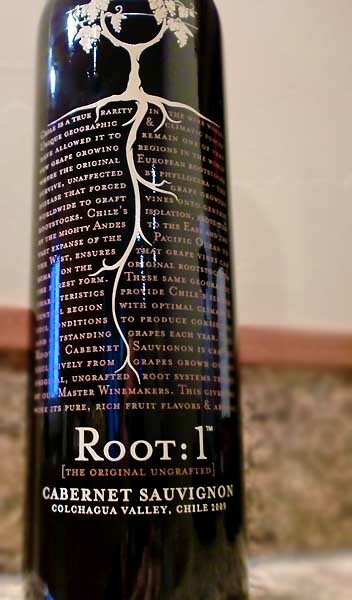 Anyway, this 2009 Root: 1 Cabernet blend is 85% Cabernet Sauvignon and 15% Syrah, with Syrah of course being the lighter, spicier version of Shiraz (they are the same grape, after all). This wine pours a dark ruby and has aromas of black cherry, plum, and mocha. On the palette, it has more notes of cherry, blackberry, and a touch of oak. It is full-bodied, with medium tannins and acidity. While this is a decent Cabernet Sauvignon, there's nothing that really stands out here. It is easy-drinking, relatively smooth, and pretty straightforward. There's nothing remarkable or all that interesting about it. Well, except the bottle art. The artwork is pretty cool. Drink This: if you want a straightforward, easy-drinking, typical Cabernet Sauvignon with a cool looking bottle. Don't Drink This: if you want a complex or challenging Cabernet. This is about as straightforward as they come. It's not bad, but just kind of plain at the $10-12 price point. Interestingly enough though, this is one of the best-selling Chilean wines. I guess because it's entirely unoffensive and easy-drinking.